Engraving of Maharana Bhim Singh of Udaipur on horseback, by Edward Francis Finden (1791-1857) and Patrick Young Waugh (1788-1829). The frontispiece of James Tod's 'Annals and antiquities of Rajast'han or the Central and Western Rajpoot States of India' published in London in 1829. Maharana Bhim Singh (r. 1778-1828) ascended to the Mewar throne at the age of 10. His reign was defined by several military campaigns with neighbouring kingdoms in an attempt to remain in control of the state. In 1818 Mewar and other princely states signed a treaty with the British and Colonel James Tod became the first Political Agent to the Western Rajput States. He was based in Bhim Singh's court and was responsible for managing the affairs between the British East India Company and Mewar. Along with his official duties, Tod became very interested in the genealogies of the Rajput Kingdoms as well as the art they produced. 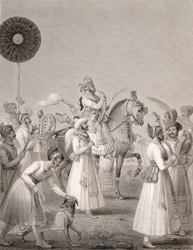 In this engraving, Maharana Bhim Singh is seen on horseback, out hunting with his attendants.